Geoff Turnbull and Joel Pringle explore how the Millers Point and The Rocks communities are fighting back in the wake of the decision to sell their homes. personal toll and stress of being told that they will be relocated against their will, has been inspiring. and their carers, have been told that property prices mean that there is no place for them in the inner city. But many are fighting back, and support has been forthcoming not only from across Sydney, but also the State. The three local resident groups, representing the diversity of the Millers Point area, have come together in a working group to co-ordinate campaign actions and oppose the forced relocations. The Government has committing to tearing apart a resilient community and important social support will be lost. Members of the Public Housing Tenants Group have been working tirelessly to ensure that their neighbours are supported through meetings with Housing NSW relocation officers and ensuring that legal rights are known. often missed in the discussion about Millers Point is the importance of this informal support and care. If the community is broken up, the Government will need to provide higher levels of social assistance to avoid households falling into further disadvantage. A poster has been produced for the campaign by Reg Mombassa, just one of a number of high profile supporters. Many unions, particularly the MUA with its connections to retired maritime workers, have expressed their support. The City of Sydney has made a financial contribution to the work of the combined working group and to legal assistance. Planning is afoot for the establishment of a ‘Friends of Millers Point’ group, to incorporate the many offers of assistance, skills and expertise on offer from the general public outside the community. Importantly, public housing residents from surrounding areas have established contact and expressed their support, knowing well that the false logic behind the Millers Point sell-off will see their own homes next at threat, along with the accelerated decline of public housing stocks as homes are sold off and not replaced. Given that many of the terrace houses are on single, large titles, and the revelations about the complex relationship between the Government and developers that is emerging from current ICAC hearings, it is not difficult to see this battle becoming reminiscent of the Greens Bans that saved this community when it was first under threat in the 1970s. No-one wants Robert Askin’s vision for high-rises over Millers Point to be completed by the Baird Government. Sydney won’t accept a class-cleansing of its diverse neighbourhoods. 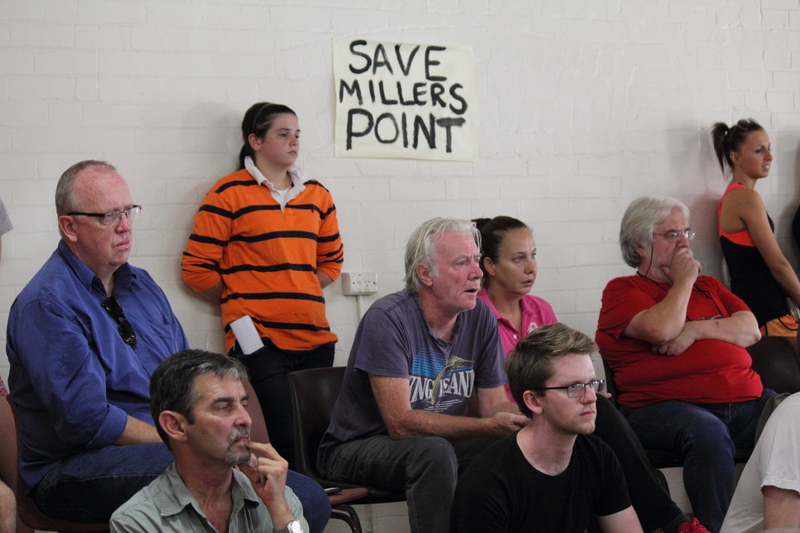 The residents of Millers Point won’t leave their homes without a fight. Geoff Turnbull is the Publications Officer and Joel Pringle the Senior Community Development Officer responsible for Millers Point at ISRCSD.